Water supply is clearly the factor most limiting the productivity and profitability of dryland cropping systems in Northern Australia. The primary aim of dryland cropping systems therefore, is to maximise the efficient capture, storage and use of the limited water (rainfall) resource – ‘more grain from your rain’, or ‘more crop per drop’. Water Use Efficiency (WUE), which can be defined in a number of ways, is a measure of how efficiently production systems, or components of systems, convert water (rainfall in the case of dryland systems) into grain or $. This paper reviews the processes and practices that influence the WUE of dryland cropping systems, with particular reference to the impact of cropping frequency and fallow length, and briefly considers future opportunities that may be available to improve the WUE of our systems. Plant water use, or transpiration, is to a large extent coincidental to plant growth. Only a minute proportion of the water taken up by a plant is incorporated into biomass – most evaporates to the atmosphere (maintaining cell turgor and providing evaporative cooling) through stomata that need to be open to allow CO2/O2 exchange. The rate of plant water use is largely driven by atmospheric evaporative demand. Where evaporative demand is high (hot, dry environments), plants will use more water to produce a given amount of biomass (and ultimately grain) compared with environments where evaporative demand is low. Average monthly rainfall and pan evaporation (a surrogate for atmospheric evaporative demand) for a northern and southern Australian location are given in Figure 1, which explains why southern locations can produce high winter crop yields with little rainfall, and also why they don’t grow sorghum! Rogriguez & Sadras (2007) conducted a more thorough analysis of the relationship between environmental conditions and potential yield for wheat and showed that attainable yields and transpiration efficiency declined in more northern and drier environments (Table 1). Fig 2 illustrates the major components of the water balance in dryland cropping systems. In simple terms, rainfall can either infiltrate into the soil or runoff, depending on a range of factors including rainfall intensity, soil surface condition and soil water content. Rainfall that infiltrates is stored in the soil profile until the profile is full, at which point any additional rainfall will either run off, or move beneath the crop rooting zone to be lost as deep drainage. Water stored in the soil profile can either evaporate directly from the soil surface or evaporate through plants (crops or weeds) as transpiration. The only productive component of the water balance is transpiration, and indeed runoff and drainage (potentially leading to soil erosion and rising salinity problems) are undesirable from an environmental perspective. Thus it is important to maximise the proportion of rainfall that is used as crop transpiration, and minimise losses through the unproductive pathways of runoff, drainage, evaporation from the soil surface and transpiration through weeds. Due to the relationship between rainfall and evaporation experienced in our environment it is generally not possible to produce profitable grain crops using in-crop rainfall as the only water source. Fortunately our soils have the capacity to store relatively large amounts of water during fallow periods. The primary (some would argue only) role of fallows in our cropping systems is to accumulate soil water to supplement in-crop rainfall to meet the water demand of the following crop. 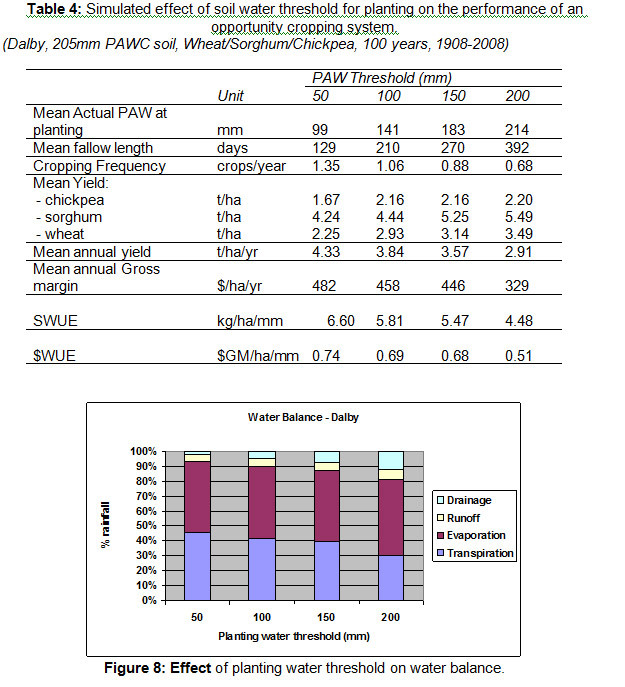 The effect of starting soil water (soil PAW at planting) on crop yield and yield reliability for wheat and sorghum at Emerald is illustrated in Fig 3. The extent to which crops depend on soil water stored during a fallow to supply their transpiration needs (‘fallow dependency’) is inversely related to in-crop rainfall and consequently varies with crop season (winter or summer) and rainfall distribution (summer/winter), as illustrated in Table 2. How efficient are our fallows – the effect of fallow length. Maintaining the soil surface in a condition that is conducive to infiltration is the key to maximising fallow efficiency. It has been widely demonstrated that maintaining surface cover through the use of zero-tillage will increase infiltration and reduce runoff and soil loss (eg Carrol et al. 1997, Freebairn & Wockner 1986, Thomas et al 2007, Freebairn et al 2009). The primary effect of surface cover is to absorb and dissipate energy contained in raindrops so that rainfall can infiltrate without dispersing and compacting soil particles at the soil surface. High levels of cover may also reduce evaporation however this effect is minimal with the levels of cover that are normally present in our cropping systems. Soil compaction caused by machinery traffic will also result in reduced infiltration rates and increased runoff (Li et al, 2001). Controlled traffic systems, which confine compaction to a small proportion of the paddock area whilst leaving the remainder of the paddock undisturbed, will result in improved infiltration and fallow efficiencies. Weeds can be a major cause of water loss during fallows so good weed control will help maximise fallow efficiencies. 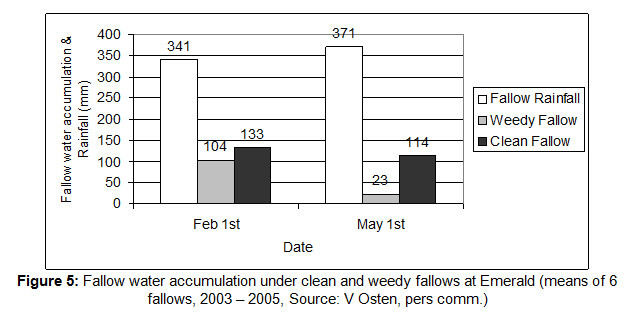 Figure 5 illustrates the effect of weed control on fallow water storage during summer fallows at Emerald. Crop Water Use Efficiency (CWUE) has been widely used as a measure or benchmark of crop performance since it was proposed by French & Schultz (1984). Unfortunately, a range of methods of calculating the Crop Water Use (CWU) component of CWUE have been used by different authors so a comparison of CWUE between different studies is difficult. The relationship between CWU and grain yield for 32 crops monitored at the sites mentioned previously is summarised in Table 3. Much of the variability in CWUE is due to variability in the distribution of in-crop rainfall. In general, rainfall falling near anthesis and during grain fill will have a greater impact on yield than rainfall in the early stages of crop growth, or after physiological maturity. While rainfall distribution is the major factor affecting CWUE, good general crop management (crop nutrition, variety selection, planting time, weed, insect and disease control, harvest efficiency etc) will help ensure that these factors are not limiting and CWUE is maximised. 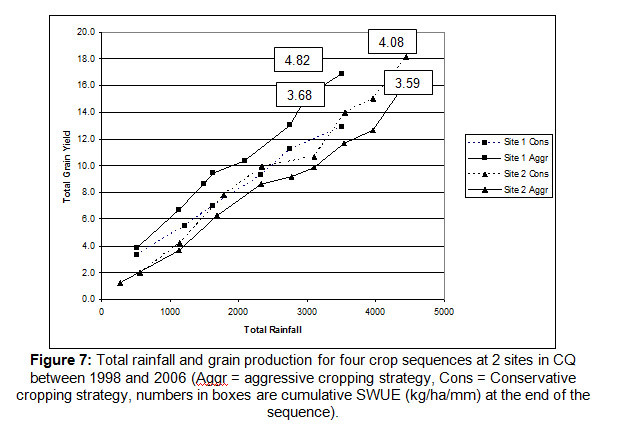 Hammer (2006) showed that delaying crop water use until at or after anthesis in sorghum crops could increase grain yield per unit of water supply. While genetics has a role to play in minimising pre-anthesis water use (eg by manipulating tillering characteristics and leaf expansion rates) there is some opportunity to control water use patterns through management. FE and CWUE allow us to quantify and compare the performance of the two major components of cropping systems - fallows and crops - in terms of water. 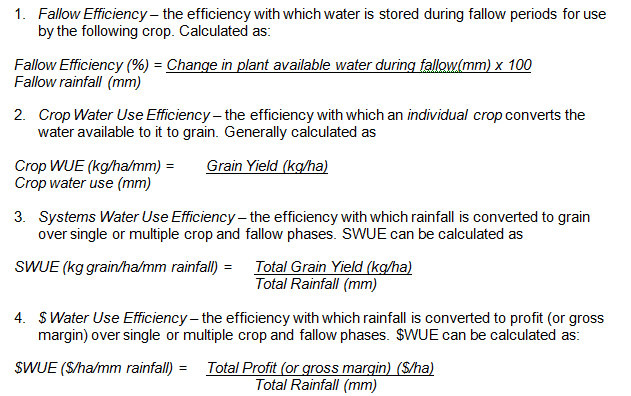 Systems Water Use Efficiency (SWUE), calculated simply as total grain produced per ha divided by total rainfall occurring over the same time period, can be used as a measure of overall systems performance that integrates the effects of fallow and crop management. Other measures of farming systems output (eg biomass produced, Gross Income or Gross margin) can be substituted for total grain production depending on the purpose of the analysis. 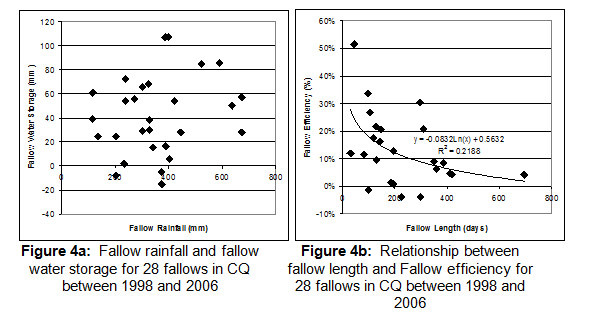 Fig 7 shows the relationship between total rainfall and total grain production for four paddocks in central Qld between 1998 and 2006. The highly linear nature of the relationship (R2 between 0.98 and 0.99, data not shown), which spans a diverse range of seasonal conditions during the period monitored, suggests that SWUE is a robust indicator of systems performance that is relatively unaffected by seasonal variability (unlike FE and CWUE). In the northern cropping region, where both summer and winter cropping options are available, producers have the opportunity to adjust the intensity of their cropping systems through their planting decisions. High cropping intensities can be achieved by planting crops whenever planting opportunities occur (and therefore on relatively low levels of stored soil water), while on the other hand, low cropping intensities will result if planting is delayed until soil water profiles are close to full. Intuitively, adopting a high soil water planting threshold will result in a smaller number of higher yielding crops (lower cropping intensity), and generally longer fallows than adopting a low soil water planting threshold. Table 3 and Figure 8 presents the results of a simulation modelling analysis of four cropping intensities, implemented by varying the level of plant available soil water required to trigger crop planting, for a wheat/sorghum/chickpea opportunity cropping system at Dalby. This data demonstrates that as cropping intensity increases, total grain production increases, average crop yields decrease, fallow length increases, SWUE increases and a greater proportion of rainfall is used for transpiration rather than evaporation, runoff or drainage. The economic optimum soil water planting threshold will depend on the relativities between grain price, crop production costs and fallow maintenance costs. In simple terms, high grain prices, low crop production costs and high fallow costs will favour more intense cropping systems. As an example, Fig 9 illustrates the effect of a higher grain price on the relationship between planting soil water threshold and Gross margin in the scenario outlined above. The effect of some of these factors on whole farm profitability is considered in a separate paper in these proceedings (Cox et al, 2010). In order for our cropping systems to remain sustainable and internationally competitive, and meet increasing world demand for food, fibre and energy, we need to search for new ways to improve the efficiency with which we use our limited (and possibly declining) rainfall resource. The following is a brief discussion of some potential opportunities. Recent research in southern Qld has demonstrated that the use of a cover crop (a crop planted with the express purpose of producing cover and without an expectation of harvesting grain) during a long-fallow following a sorghum crop can increase yields in the following wheat crop (Price et al, 2006, Whish et al, 2009). The extra cover produced during the long fallow captured more additional water than was used to produce that cover, and there were other benefits that may be attributable to improvements in soil biology. Relay cropping is the practice of planting the next crop before the last one is harvested - the ultimate in increasing cropping intensity! Relay cropping is practiced in many areas of the world, primarily in environments with a higher rainfall than most of the northern region grain cropping zone. Nevertheless, relay cropping may have a role in situations where excess rainfall occurs after a crop has stopped using water but prior to harvest. Advances in precision machinery guidance may make the planting or harvest of one crop while another is in the ground a practical proposition. Grain production in water limited environments suffers from the need to utilise large quantities of water in the vegetative stages of growth with no guarantee that further water will be available for grain fill. We are all familiar with situations where well grown crops fail to yield due to terminal water stress. If crop biomass was the marketable product, such crops could be harvested when water supplies were exhausted. The development of a biofuels industry may present opportunities in this regard in the future. Fibre production from crops like industrial hemp is another opportunity. Perennial pastures and crops are efficient users of rainfall due to the absence of the inefficient fallow period and their ability to respond to rainfall whenever it occurs. There are also significant environmental benefits associated with maintaining living cover year round. Commodity prices will continue to determine the relative economics of grain vs pasture based production systems, though other benefits arising from spatially integrated mixed faming systems (eg free N from legume pastures) need to be taken into account and may be increasingly important as energy costs rise. Imagine if we could spray a biodegradable product over a fallowed paddock after a significant rainfall event to eliminate further evaporation and conserve soil water until the next optimum planting date! The CRC for Polymers is currently experimenting with applications for thin-film polymers in agriculture. Current products come in a solid form (like Glad-Wrap) and are not suitable to our cropping systems due to cost and the impact of stubble on the thin films, however future advances in materials technology has the potential to deliver more suitable products in the near future. An improved ability to predict weather events in the short and medium term would eliminate much of the uncertainty associated with the decisions that grain producers make on a day-to-day basis. Advances in our understanding of climatic phenomena such as ENSO and MJO are likely to lead to the development of more robust tools to help producers make decisions regarding input levels, crop selection or planting time that will reduce variability or risk of outcomes. Carroll C, Halpin M, Burger P, Bell K, Sallaway MM and Yule DF (1997) The effect of crop type, crop rotation, and tillage practice on runoff and soil loss on a Vertisol in central Queensland. Australian Journal of Soil Research 35, 925-939. Cox H, Routley, R and Rodriguez, D (2010) Modelling the profit and risk outcomes of a range of soil water triggers and cropping area intensities. Proceedings 2010 GRDC Advisor Update – Goondiwindi. Dang YP, Routley RA, McDonald M, Dalal RC, Singh DK, Orange D and Mann M (2006) Subsoil constraints in Vertosols: crop water use, nutrient concentration, and grain yields of bread wheat, durum wheat, barley, chickpea, and canola. Australian Journal of Agricultural Research 57, 983-998. Freebairn, DM, Cornish PS, Anderson WK, Walker SR, Robinson JB and Beswick AR (2006). Management systems in climate regions of the world – Australia, In ‘Dryland Agriculture – Agronomy monograph No 23’ American Society of Agronomy, Winsconsin. Freebairn, DM and Wockner, GH (1986). A study of soil erosion on vertisols of the eastern Darling Downs, Queensland. I. Effects of surface condition on soil movement within contour bay catchments. Australian Journal of Soil Research 24, 135-158. Freebairn DM, Wockner GH, Hamilton NA, Rowland P (2009) Impact of soil conditions on hydrology and water quality for a brown clay in the north-eastern cereal zone of Australia. Australian Journal of Soil Research 47, 389-402. French, RJ and Schultz, JE (1984). Water Use Efficiency of Wheat in a Mediterranean-type Environment. I. The relation between yield, water use and climate. Australian Journal of Agricultural Research 35, 743-764. Li X, Tullberg JN and Freebairn DM (2001). Traffic and residue cover effects on infiltration. Australian Journal of Soil Research 39, 239-274. Mowat J, Routley RA, Spackman G and Sullivan A (2006) Factors affecting planting decisions in CQ farming systems- lessons from on- farm research. Proceedings of the 13th ASA Conference, 10-14 September 2006, Perth, Western Australia. 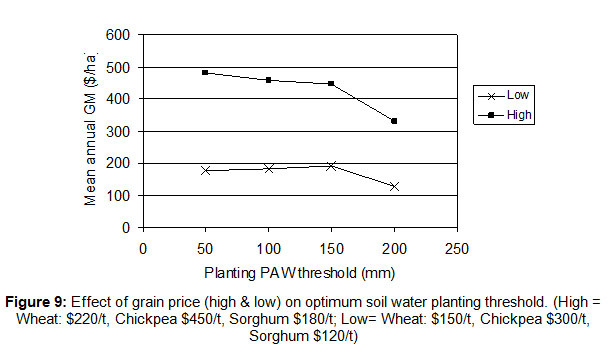 Price L, Castor P and Thorn S (2006) Short term cover crops increase wheat yields in southern Queensland. Proceedings of the 13th ASA Conference, 10-14 September 2006, Perth, Western Australia. Rodriguez, D and Sadras, VO (2007). The limit to wheat water-use efficiency in eastern Australia. I. Gradients in the radiation environment and atmospheric demand. Australian Journal of Agricultural Research 58, 287–302. Thomas GA, Titmarsh GW, Freebairn DM, Radford BJ (2007) No-tillage and conservation farming practices in grain growing areas of Queensland - a review of 40 years of development. Australian Journal of Experimental Agriculture 47, 887-898.